Congratulations to two of our talented Fiskars Craft Ambassadors who recently were successful in naming some NEW Fiskars squeeze Punches.......Annette Hanigan (Australia)and Andea Senn(New Zealand). August Inspiration – Using Sequins. Hi everyone. Here is a layout I did a few weeks ago but it just didn’t seem quite finished. When I noticed what today’s inspiration would be, I thought perfect, just the right finishing touch. So I’ve added a border of sequins down the side of my layout. I also added a few on top of the buttons as centerpieces for the vellum flowers. Sequins add another level of texture to a layout and are so quick and easy to adhere. Heidi Grace We Are Family Patterned Paper and Focked Paper, Cardstock Alpha Stickers, Dimensional Word Stickers and Borders Rubons. ROS MADLEY! Congrats to you Ros, I loved your beautiful layout and the great mix of machine and hand-sewing you used. Simply stunning! Ros, please email us here: fiskarscraft@yahoo.com.au so we can send out your fab prize. And a big thankyou to all who entered. Remember you can check out all the wonderful entries in our challenge gallery found on the sidebar. And don’t forget to look out for our next monthly challenge coming soon to the blog. Hi everyone, just reminding you all that we have one week left to go for this month’s SEWING challenge. Here is the post with all the details about it. And I thought I’d share this layout that I did recently for a sketch challenge on another site using Cloud 9 Chocolate Chalet. For the scallop border up the middle of the layout I traced several times around the large round brad at the bottom before adhering it and then I hand-sewed over top. Don't forget to get your entries in - there's a great prize to be won! The possibilities are endless! I love using sewing on my layouts; it really adds nice texture to my pages. Here’s a couple of layouts I did using sewing. In this layout I used sewing to create a border around the outside of my layout and I then sewed frames around my photos a couple of times in contrasting thread to emphasise the photos. 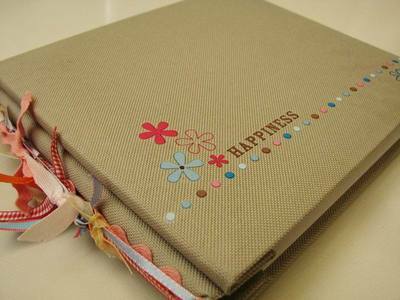 I also sewed lines through the stickers in my title and I created journaling lines with sewing too. 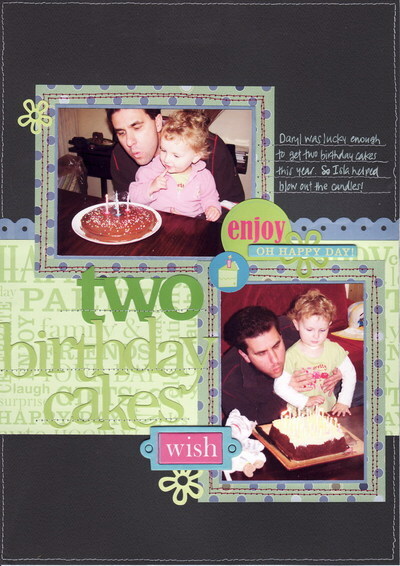 Heidi Grace It’s My Party paper, cardstock stickers, alpha stickers and chipboard shapes. 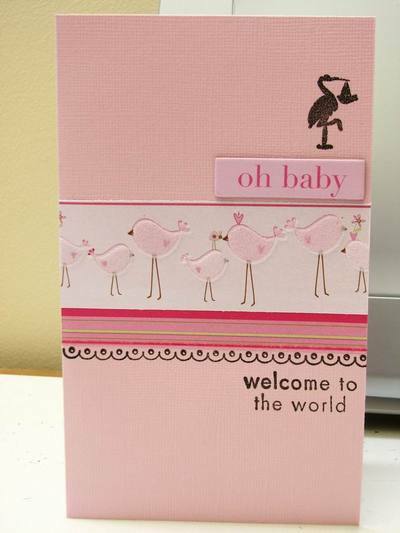 Heidi Grace Baby Girl cardstock stickers. In this layout I again used sewing to create a border around the outside of my layout and I hand-sewed another border around the central photo. I attached all the plastic embellishments by cross-stitching and I hand-sewed a decorative pattern into the top flower. 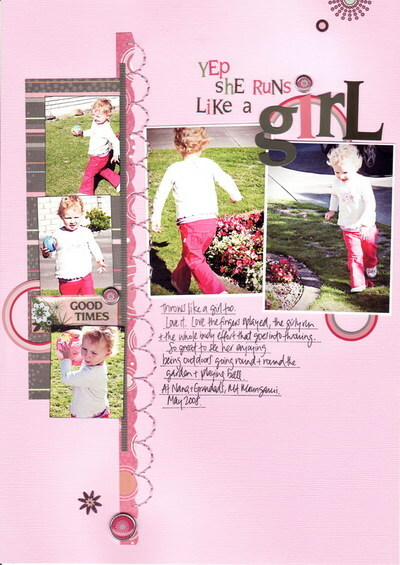 Heidi Grace Baby Girl papers and plastic embellishments. Heidi Grace Love alpha stickers. 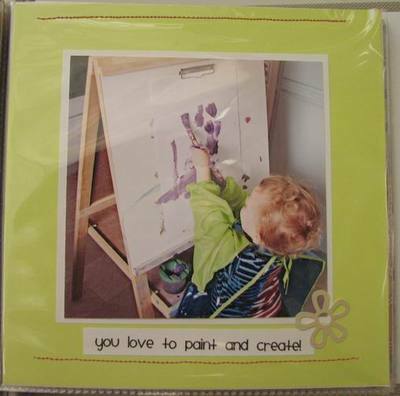 So don’t forget the challenge is to use sewing on a layout or a card. Send your layout to: fiskarscraft@yahoo.com.au and remember you have until the end of July to get your layouts or cards in. 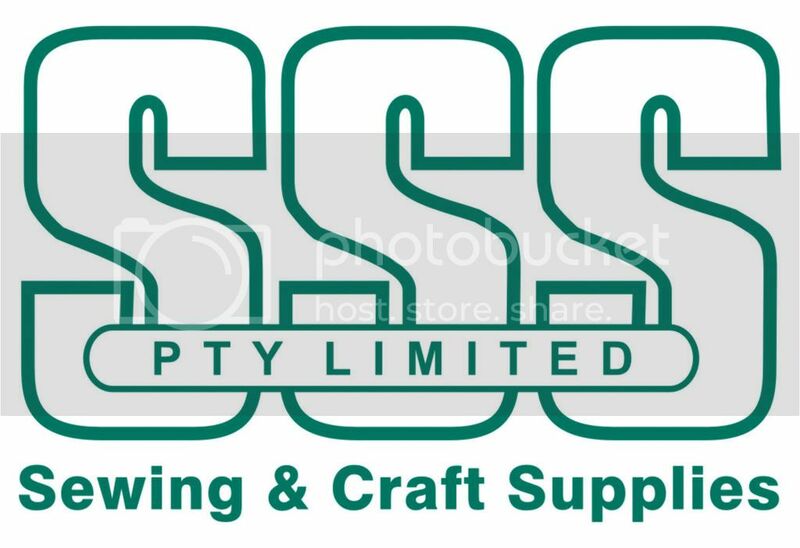 There is a fabulous prize of a sewing Tool Taxi and some consumables. Have fun, I can’t wait to see what you all come up with! Just wanted to share this little minialbum I made for my daughter. She really loves looking at photos (especially of herself!) 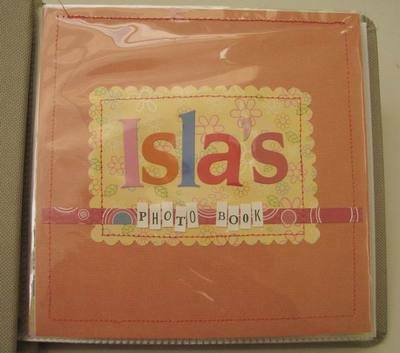 and scrapbook albums but being 2.5 can sometimes be a little too rough with some of them. So I thought I’d make her a little album all of her own. 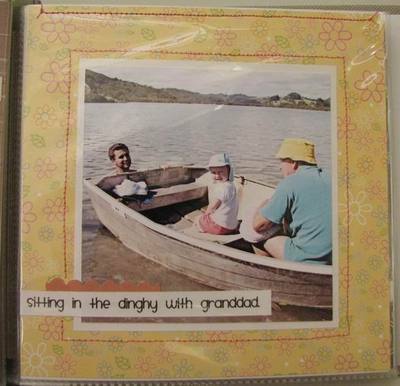 I got this idea from one I’d seen by Jill Hornby (one of my favourite scrapbookers) who made a teeny album for her daughter. This one is a bit bigger being 6x6 in size and I’ve sewn the opening closed on the page protectors so the pages can’t be pulled out by little fingers. I’ve used a mixture of papers by Cloud 9 from the Travel and Chocolate Chalet ranges plus Heidi Grace Its My Party papers. I wanted to keep the design simple and bright with a focus on the photos so I’ve added a little journal strip to each page, some sewing and some stickers too. Hi everyone, I thought I’d share some pages I’ve been doing in a Circle Journal using some Heidi Grace products. This is for my friend Erica’s journal (don’t peek Erica!) 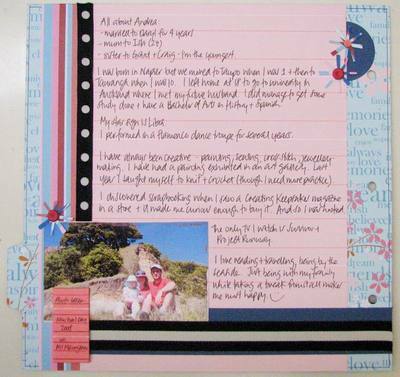 and the theme of the journal is Scrapbooking Friends so essentially it’s an All About Me page that I needed to do. 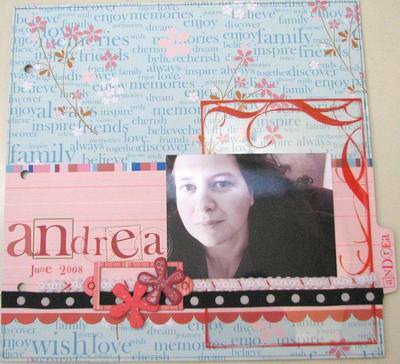 I used 3 papers from the Heidi Grace Garden range in gorgeous blues and pinks. The main background paper I’ve used has lots of great words on it that go really well with the theme and the pink striped paper was great for journaling directly onto. I’ve also used some Glitter Red chipboard shapes as accents. The title is done in rubons from the Jolly & Bright range while the smaller rubons are Common Letter Rubons in Red. 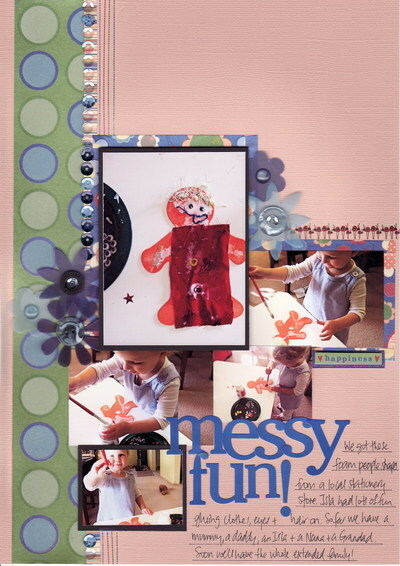 The red scallops along the bottom are Border Cardstock Stickers again from the Jolly & Bright range. 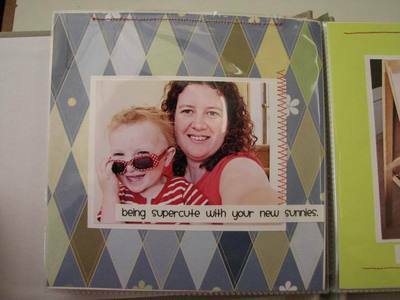 On the second page I’ve also used the Large Circle Squeeze Punch and the Bling Squeeze Punch. Hi everyone, Andrea here sharing my scrap space with you all. 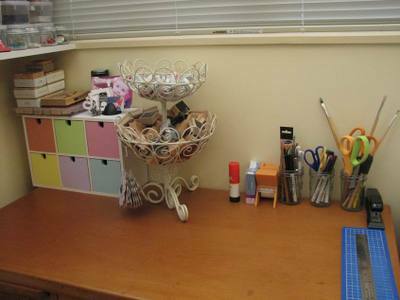 Although this is our office, its not dedicated solely to my scrap supplies (much as I’d like it to be!). There is also a couch in here and a bookshelf with albums and magazines in and all of my daughter’s growing craft supplies. So this is my corner of the room. It’s very tidy right now because this was a great excuse for me to tidy and to cull. I’m one of those people who need to see things in order to use them so if it’s hidden away it doesn’t get used – so every now and then I cull my supplies. I’m actually becoming quite ruthless at this. I’ve come to realize that I don’t need piles of supplies and having a small scrap space like this works well for me. You can see my desk where I work – I like to scrap standing up most of the time. Next to my scrap desk is my computer desk where I also have a scanner and printer – very important as I print all my photos at home and also play around a lot on the computer. 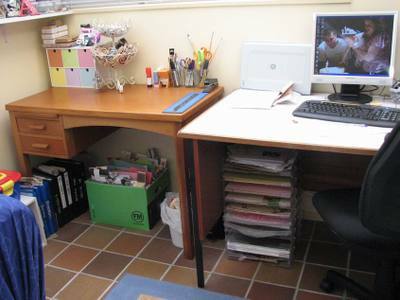 Under the computer desk is where I store my patterned paper and cardstock in acrylic paper trays. 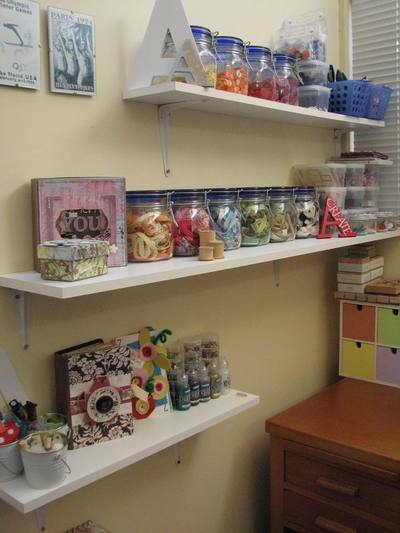 This works for me in this space but eventually I think I would like to try vertical storage. On my desk I keep tools I use a lot: pens, scissors, knife, ruler and mat, photo tabs and glue stick. Also I have this cool basket that I keep mounted stamps and ink cubes in. Beside that is a set of wooden drawers that I keep other wooden stamps in plus inks, acrylic blocks and paints. In the desk drawers I keep spare computer inks, photo paper, printer paper and other odds and ends. Beside the desk I have these cubes where I keep several plastic containers. In them are paints, Cuttlebug dies etc, spare minialbums, chipboard letters and shapes, cardmaking equipment, extra embellishments, bead jewellery equipment (another craft I do), embroidery thread and my Fiskars Stamppress. On top of the cubes I keep current and unfinished projects, various glues and my toolbox which is filled with lots of useful tools – this is great for lugging to crops. Beside the cubes I keep my Fiskars trimmers, shape templates and ScrapBoss and my Cuttlebug. 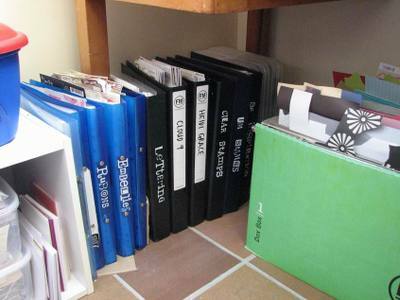 On the other side of the cubes I have folders in which I keep all my flat scrapbook supplies such as stickers, rubons and alphas. I take everything out of its original packaging and they go into clear pockets in alphabetical order of manufacturer. Except for Heidi Grace and Cloud 9 which have files of their own. I also have a folder for clear acrylic stamps and unmounted stamps which I keep attached to Ezimount sheets. Also under the desk is a file folder for all my scrap paper and cardstock. On the wall beside my desk I have 3 shelves. The top shelf contains button jars and baskets for punches. The middle shelf has ribbon jars (you can see I like to have things arranged by colour!) 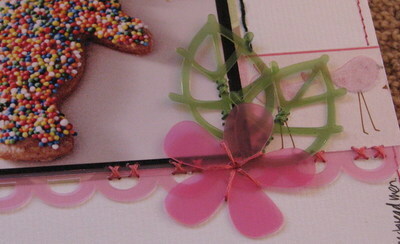 and containers for embellishments such as tags, flowers, tape, felt etc. 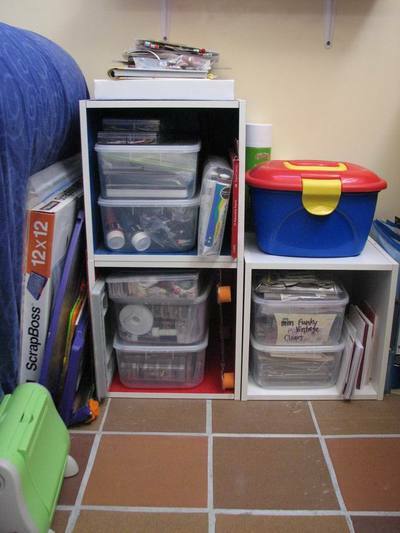 The bottom shelf has little buckets filled with bead tubes, containers for small embellishments such as brads, sequins, snaps and eyelets etc and also glitter glue containers. You can see also on these shelves I like to display a few minialbums that I’ve done. 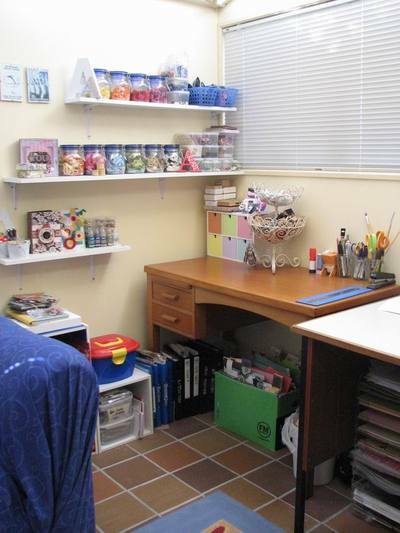 As I said on the other side of the room is a bookshelf where I keep my albums, more minialbums, idea books and magazines, felt and fabric pieces and all my daughter’s craft supplies. So that’s it, small but it’s all I need, for now! 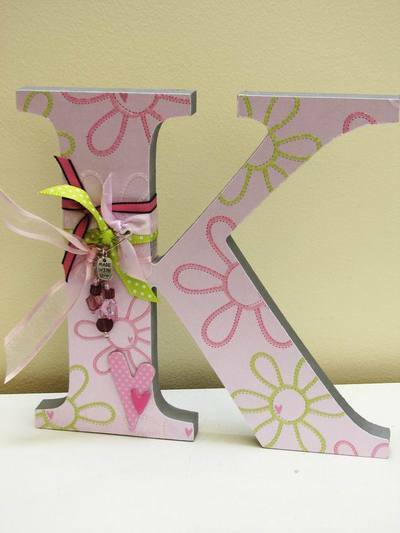 A friend of mine had a wee baby girl recently so I made her a card and covered a wood initial letter as a gift for her room. 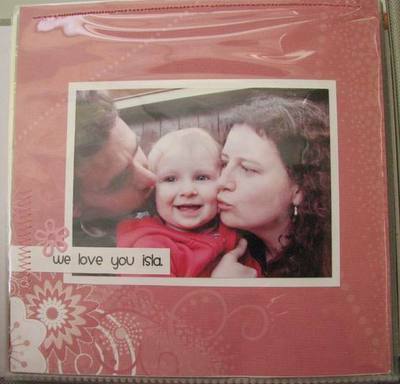 I’ve used the Heidi Grace Baby Girl range which is just so lovely with the flocked and glittered papers. 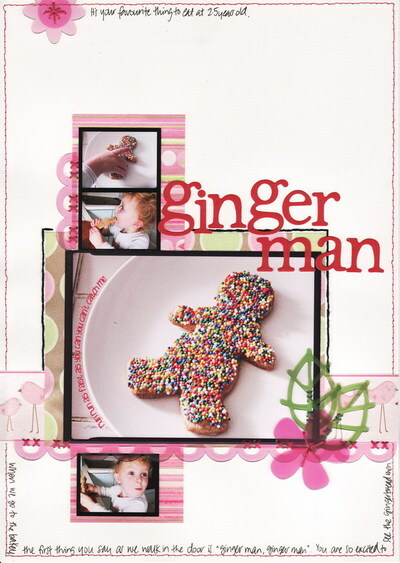 The chipboard title on the card is also from the same range and I’ve added stamps from the Fiskars Basic Font set and Baby set as well. For the initial letter I’ve painted the edges in silver paint and then covered with patterned paper plus some chipboard hearts all from the Heidi Grace Baby Girl range again. Finally I’ve added some ribbon tied onto one side with a tiny safety pin holding some bead charms on it. I really love this range – its just so gorgeous! BOM – favourite holiday destination. I love travelling, and have travelled to many wonderful places around the world. 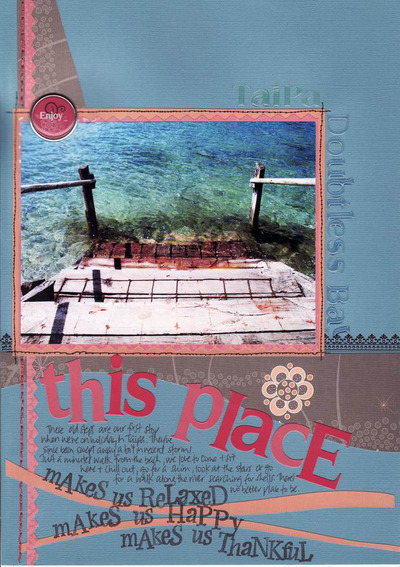 I love seeing new things, new sights and cultures and people but the one place I and my husband’s family love to go to time and again is a little town near the top of New Zealand called Taipa. We have a family bach (holiday home) there, though actually it’s more like a family enclave with about 5 houses owned by various member of the family there. So it’s also a great place to catch up with the extended family and just relax. Only a few metres away is the river and the steps in this photo where we spend so much time swimming, rowing in the dinghy and searching for shells. A bit further away is the main ocean beach where we love to swim in the surf and walk along the beach. At the far end are the rocks where my husband proposed to me, so it’s a truly special place to us. It’s about 4 hours drive from where we live but we try and go there a couple of times a year, as often as we can really. Time just seems to stand still there and you can forget about the city and work and computers and just enjoy life. In making this layout I initially had planned to use the Cloud 9 Travel range but then discovered that the colours in the Chocolate Chalet range fitted perfectly. I have used the Raindots Letter Stickers from the Travel range but everything else is Chocolate Chalet. Love those oranges, pinks and browns together against the blue!